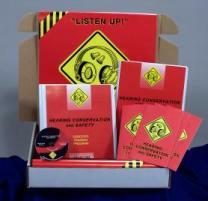 MARCOM's "Hearing Conservation and Safety" Regulatory Compliance Kit™ has been created specifically to involve employees in the process of understanding noise hazards and to help facilities in fulfilling the OSHA Occupational Noise Exposure and Hearing Protection Standard (29 CFR,1910.95) training requirements. Materials is the Kit include a video program, a compliance manual, five motivational posters, and 30 employee booklets. Everywhere we go, we encounter noise. And if this noise is loud enough, or has certain characteristics, it can cause damage to our hearing... often permanently. Millions of Americans have a measurable hearing loss, most often caused by "on-the-job" injuries. Yet many employees don't realize that not only can hearing problems affect their work, they can alter their personal lives dramatically as well. The kit addresses the major areas needed to comply with the Standard. The Compliance Manual provides a detailed summary of the information needed to comply with the Standard, as well as a "fill-in-the-blank" written Hearing Conservation Program. The posters in the kit emphasize the importance of using proper hearing protection. The videotape and employee booklets include information on how our ears "work", types of hearing damage/loss, common causes of hearing damage/loss, potential effects of hearing damage, noise avoidance and hearing safety practices, selection and use of personal protective equipment and more. The video program in the kit comes with a comprehensive leader's guide, reproducible scheduling & attendance form, employee quiz, training certificate and training log.